Kovax is the leading Manufacturer of Japanese Coated Abrasives since 1930. KOVAX produce high quality fine finishing abrasives for all market sectors, specially perfected for Automotive car refinish and high quality furniture manufacturing. 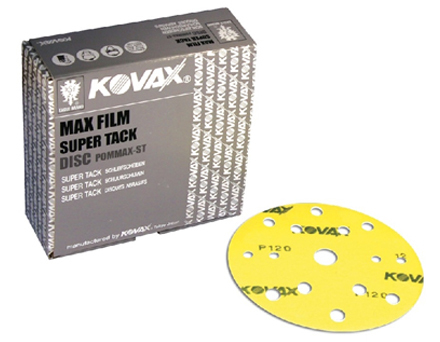 Kovax is a producer and supplier of innovative and time saving quality abrasives. Kovax Europe B.V. has its roots in Tokyo, Japan, where the headquarter of the holding company Kovax Corporation is situated. The European market is served from our head office in Almelo, the Netherlands, while the products are produced in Japan, for more than 85 years. This enormous amount of knowledge in combination with one of the most modern factories worldwide enables us to deliver products, that save time “ONE FAMILY OF PEOPLE, THAT CONTINUOUSLY OFFERS ABRASIVES SOLUTIONS, BASED ON A REALISTIC, MUTUAL AGREEMENT.” WHO ARE WE? and never fail to amaze. Since its foundation in 1930, Kovax has become the undisputed number 1 abrasive brand in Asia. Achieving a yearly growth up to 20% in a shrinking market is just yet another proof of our unique and unrivalled Japanese quality. Thanks to years of research and development, Kovax products are not only implemented in the automotive industry, but also found their way to the wood, OEM and yacht industry.